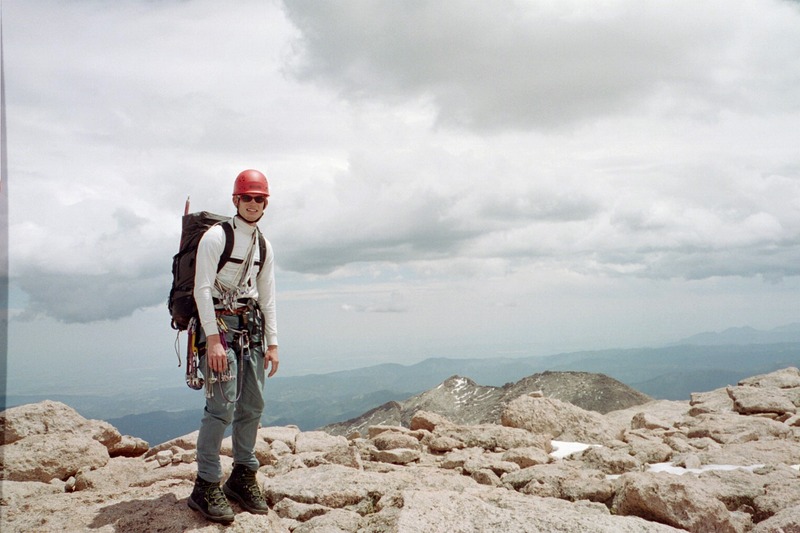 In July of 2004, I teamed up with an old friend, Christian, to climb Keiner's Route on Long's Peak. It was a route that I had been planning to climb for quite a while, but simply hadn't been able to get around to doing it. We made the hike up to chasm lake, under a beautiful clear sky. 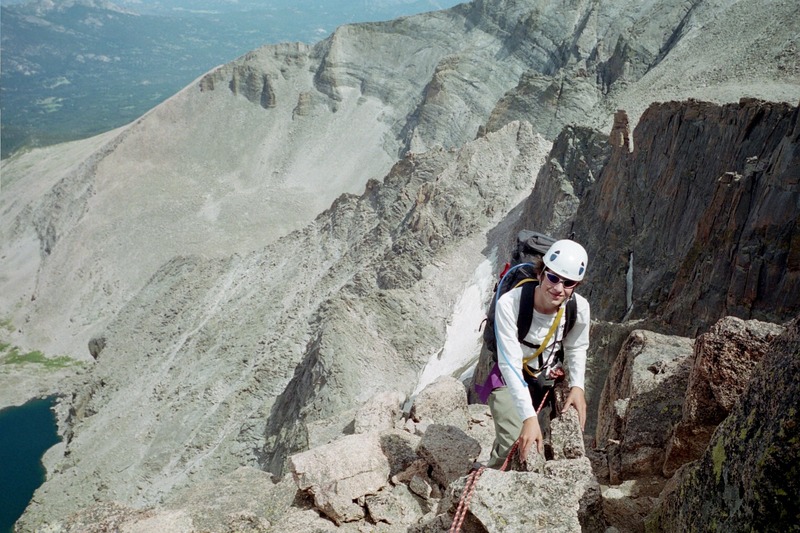 We bivied in the same spot I'd used for my climb of the Notch Couloir, some years earlier. The bivi cave was lots more spacious without the deep snow covering the entrance. There were a few light rain showers that night, but nothing to get too worried about. Next morning we were up early and headed up Lamb's Slide. We had packed light, and were carrying all of our bivi gear with us, so we wouldn't have to detour back to our bivi site after the climb. Cramponing up Lamb's Slide was slow, but uneventful, and we soon found ourselves on the Broadway ledge. My previous traverse of this ledge had been in completely dry conditions, however, this time, we had to climb over and around deep, soft snow. We roped up and belayed several sections where the snow forced us into somewhat questionable situations with big exposure. 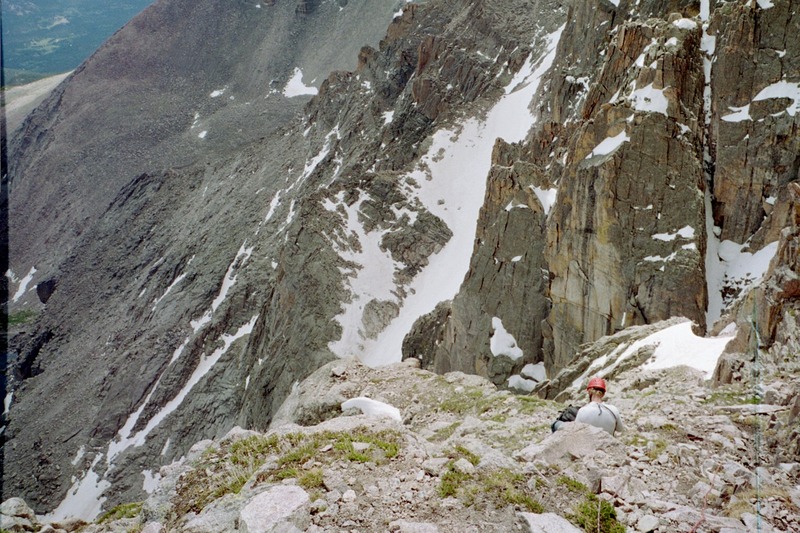 We reached the Notch, and tackled the rock pitch to the right of the Notch Couloir. The climbing was fun, but I wasn't certain of the exact route, so I tended to get myself onto some rock that was perhaps a tiny bit harder than it needed to be. 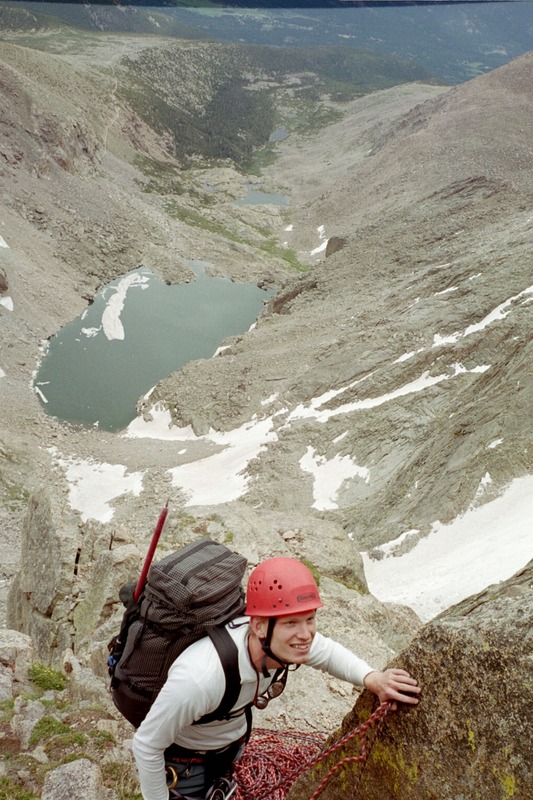 When I reached the top of a big, deep cleft, I wasn't sure which way to go. 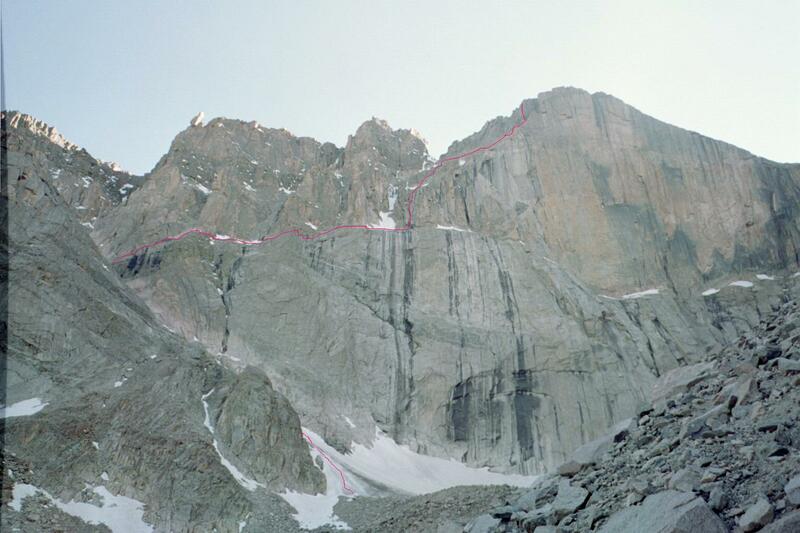 After Christian explored both the cleft to the right, and the route straight up and to the left, he determined that right was the way to go. There were only 4 pitches or so of technical climbing, and before long, we were able to stop belaying each other and start the long scramble up and to the right, along ledges, up steps, and relatively easy ground. We belayed one another up the exposed steps at the top of the face, and then we were past the climbing and all that was left was the long hike to the summit. The summit was crowded with a goodly number of people, most of whom had ascended by the regular route. 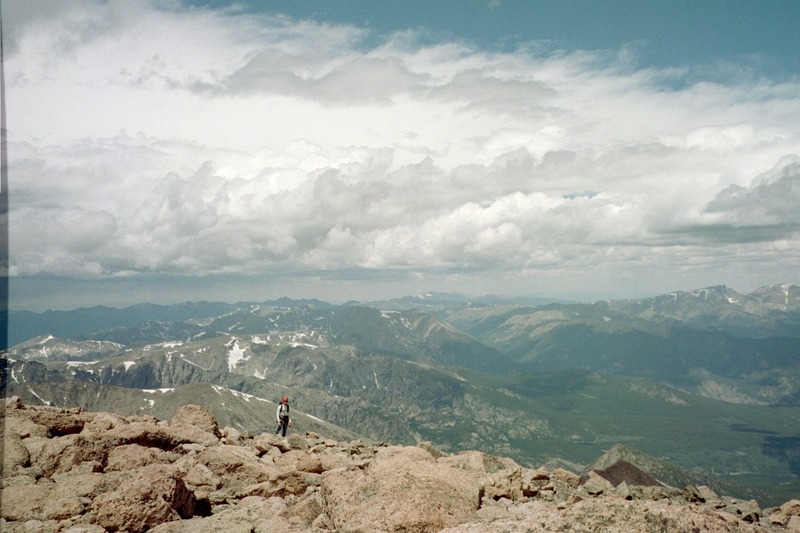 We were enjoying ourselves, basking in the warm sun, when a distant thunder clap reminded us that we were still in the mountains, and that we really needed to get down before the inevitable afternoon storms hit us. Luckily, there was a group heading down the cables route, which was also our intended descent. 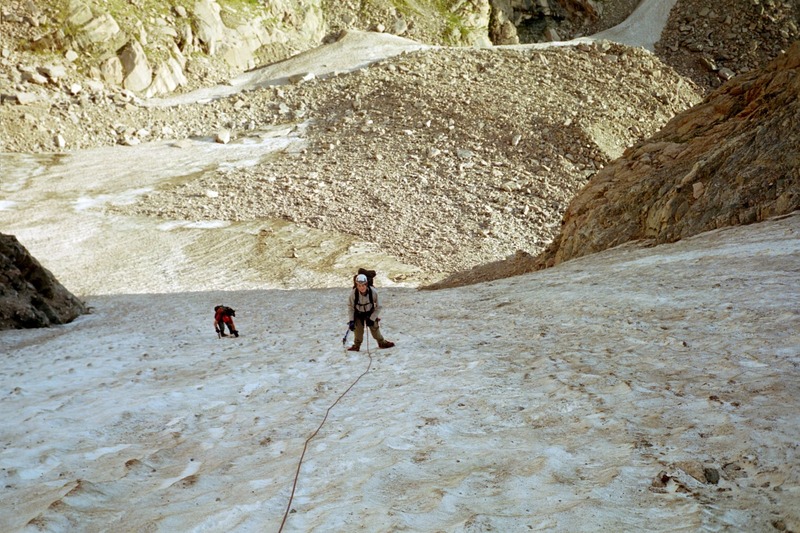 We followed them, traversing across to the rappel station at the top of the cables route. 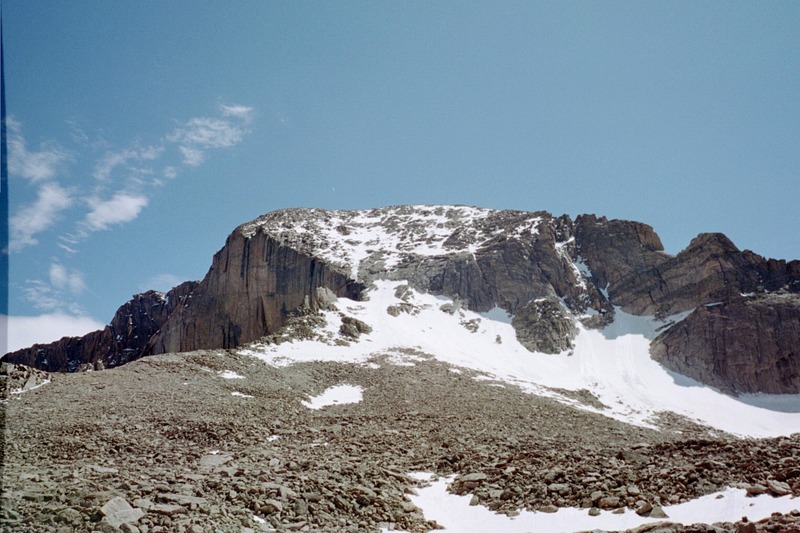 The traverse was on soft snow that would sometimes slide out from under your feet as you were walking on it. When I would feel the snow underfoot give way, I would get freaked out, wishing for more substantial footing. The sight of approaching dark clouds and distant lightning gave me an incentive to keep moving, however. As we approached the first rappel station, the storm hit us, pelting us with rain, sleet, and hail, punctuated with thunderclaps. The party ahead of us kindly allowed us to use their ropes for the rappels, saving us precious time, and allowing us to escape our exposed position a bit sooner than if we had needed to rig our own rappels. Just when we finished the last rappel, the storm blew over, much to my relief. 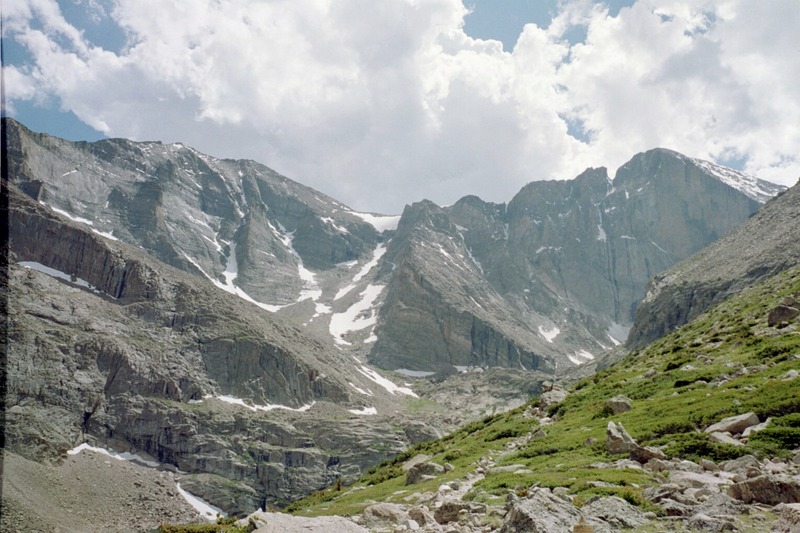 We glissaded down the gentle slope to the boulder field below, and then set about the long, familiar hike back to the parking lot. I wasn't looking forward to the knee pounding hike back, but it certainly was better than being stuck on the mountain in a thunder storm. The climb went well. 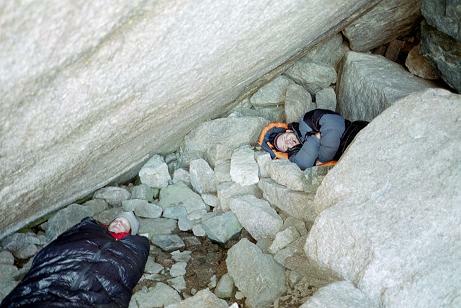 We bivied under some rocks near the base of the route, then got up early the next morning. I had brought my son up to Lamb's Slide previously to practice crampon technique, and he seemed to remember what he had learned, cruising up the hard snow without any problems. The climb was fun, although I managed to get a bit off route and climb some technical "variations" to the left rather than the straightforward scramble up the staircase on the right. The weather was good, the rock was sound, and we all enjoyed ourselves. We were happy to finally reach the summit, however. After we reached the summit, we had some difficulty locating the rappel stations on the cables route, so we opted to descend the keyhole route. If I had known how long that would take, I think I would have looked a bit harder for the eyebolts on the cables route. After what seemed like forever, we finally made it down the keyhole, and then faced the long, slow trudge back to the car. We were all pretty beat, but overall, it was a fun trip. I was proud of my son, who had done very well on his first alpine climb on a big peak.